The American Gold Eagle bullion coin is the most popular gold bullion coin among investors. It offers a convenient, cost-effective way to add physical gold to your investment portfolio. The American Gold Eagle is an official gold bullion coin of the United States. 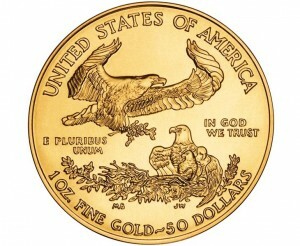 Along with the American Silver Eagle coin, the Gold Eagle was first minted in 1986. The obverse features a Liberty design by Augustus Saint-Gaudens. This design first appeared on the US $20 gold piece from 1907 to 1933. The reverse features an American eagle carrying an olive branch flying over a nest containing an eagle and hatchlings. It was designed by sculptor Miley Busiek. This coin is produced at the West Point Mint in New York, and so is marked ‘W’ underneath the date. It is produced in four sizes: 1 ounce, ½ ounce, ¼ ounce, and 1/10 ounce. All four sizes are identical in design with the exception for markings indicating the size and face value of the coin. The face value ranges from $5 for the 1/10 ounce coin to $50 for the full one ounce coin. The 1/10 troy ounce coin is 16.5mm in diameter, the ¼ troy ounce coin is 22mm in diameter, the ½ troy ounce coin is 27mm in diameter, and the 1 troy ounce coin is 32.7mm in diameter. By law, the gold must originate from sources within America. Each coin is 22 karat or .9167 fineness, produced from gold (91.67%) alloyed with copper (5.33%) and silver (3%) to produce a wear-resistant coin. Because the fineness of each coin is 91.67%, the actual weight of each coin is slightly larger to account for the non-gold metals it contains. For example, the one troy ounce coin contains one troy ounce of gold, with a total weight of 1.0909 grams. Because they are produced by the United States mint, each coin’s metal content, purity, and weight is guaranteed by the U.S. Government. Each year, production of the gold Eagle is limited. 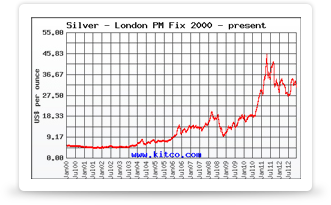 Mintage figures have ranged from 140,016 in 2007 to 1,505,026 in 1999. This coin can be purchased directly from the U.S. Mint, or from a network of authorized distributors. 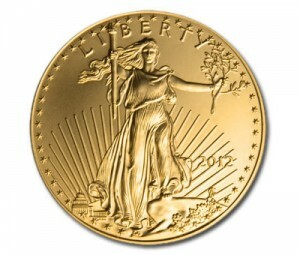 American Gold Eagle coins are sold in both uncirculated and proof versions. The proof version of this coin is produced with a specialized minting process that results in a high-polish, mirror-like background and softly frosted yet highly detailed foreground image. Each American Eagle Gold Proof coin is sealed in a protective plastic case and mounted in a presentation box. Gold Eagle coins are technically considered legal tender at their face values. However, the value of the gold they contain is significantly higher than the symbolic face value. The value of these coins is generally approximate to the current spot price of the gold they contain, plus a small per-coin premium. This value fluctuates with the market, and is not based on the coin’s symbolic face value. Produced to compete with global gold bullion coins like the Canadian Maple Leaf and South African Krugerrand, the gold American Eagle coin gives investors the opportunity to add physical gold to their portfolio. Easy to buy, store, and sell, American gold Eagles are easily converted to cash, which has made it the most popular gold bullion coin in the United States.